Looking for a great hotel near Rockland for your mid-coast Maine vacation? 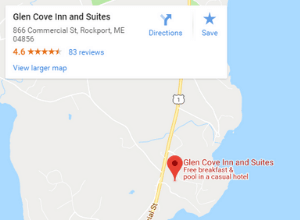 We invite you to take a look around at Glen Cove Inn and Suites. Our suites are well-suited for family vacations, business travelers, and romantic getaways. Plus, guests enjoy an amazing better-than-continental breakfast, with homemade cinnamon rolls, muffins, and make-your-own waffles, served each morning on a covered terrace. And there’s the heated outdoor pool. Glen Cove is the perfect mix of amenities and affordability. A spacious King Suite that features one king bed downstairs and two full beds upstairs and a kitchenette. The Family Suite is located in the main house at the top of the property and features a king-sized bed and a separate alcove with an additional set of bunk beds. Spacious 600 Sq Ft Three Queen Kitchenette Suite that features two queen beds in One room and one queen bed in a separate bedroom. Spacious 800 Sq Ft Three Queen Kitchen Suite that featurestwo queen beds in one room and one queen bed in a separate bedroom.